The discovery pushes back the roots of agriculture in China by 12,000 years. The global emergence of similar practices around 23,000 years ago hints that agriculture evolved independently around the world, perhaps as a response to climate change. The first evidence of agriculture appears in the archaeological record some 10,000 years ago. But the skills needed to cultivate and harvest crops weren't learned overnight. Scientists have traced these roots back to 23,000-year-old tools used to grind seeds, found mostly in the Middle East. Now, research lead by Li Liu, a professor of Chinese archaeology at Stanford, reveals that the same types of tools were used to process seeds and tubers in northern China, setting China's agricultural clock back about 12,000 years and putting it on par with activity in the Middle East. Liu believes that the practices evolved independently, possibly as a global response to a changing climate. The earliest grinding stones have been found in Upper Paleolithic archaeological sites around the world. These consisted of a pair of stones, typically a handheld stone that would be rubbed against a larger, flat stone set on the ground, to process wild seeds and tubers into flour-like powder. Once the stones are unearthed, use-wear traces and residue of starch grains on the used surfaces can be analyzed to reveal the types of plants processed by the long-dead owners. 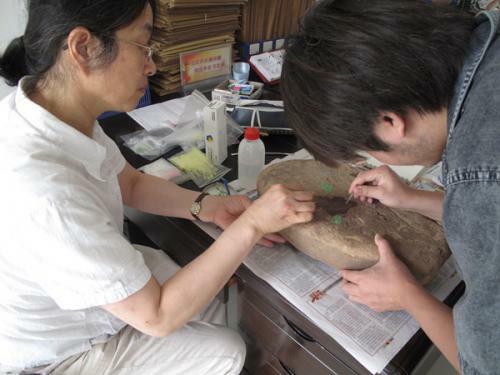 Liu focused on stones discovered at a roughly 23,000-year-old site in the middle of the Yellow River region in northern China. Most of the agricultural research in this area has focused on the Holocene period, roughly 10,000 years ago, when people were domesticating animals and farming. 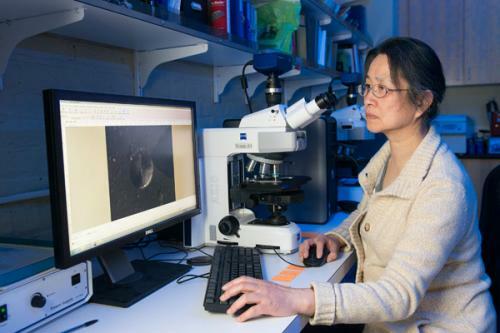 "The roots of agriculture must be much deeper than 10,000 years ago," Liu said. "People have to first be familiar with the wild plants before cultivating them. The use of these grinding stones to process food indicates that people exploited these plants intensively and became familiar with their characteristics, a process that eventually led to agriculture." Indeed, the starch analysis has shown traces of grasses, beans, wild millet seeds, a type of yam and snakegourd root – the same types of food that people in the region would domesticate thousands of years later. Domesticated millet, in particular, became the main staple crop that supported the agricultural basis of ancient Chinese civilization. Similar patterns of activity existed around the world at the same time, but this is the first evidence that people in northern China were practicing comparable methods. In particular, the extensive use of seeds by people in China and elsewhere could help paint a picture of humans adapting to a worldwide changing climate during an ice age. "Wild millet seeds are very, very small, and people would need to spend a lot of time to gather enough seeds to be useful," Liu said. "This suggests either that they were under some pressure and better foods were not readily available, or that seeds had suddenly become more abundant and easier to collect. "We know that during the Ice Age, populations were under pressure. I think that our finding suggests that there was some general evolutionary trend, and that people around the world reacted to climate change in a similar way, although independently." Incidentally, the presence of tubers could point to the dawn of another discipline. "Yam and snakegourd root that we found can be used both as food and as traditional herb medicine in China," Liu said. "Whether or not they were used as medicine, we don't know yet, but this discovery could suggest that people understood, or were developing an understanding of, the medicinal properties of some of those roots." The study was published last month in the Proceedings of the National Academy of Sciences.